Set in small town America this film, written and directed by Kent Jones, deals with everydayness—an eternal awareness of death and dying, but most importantly of living. 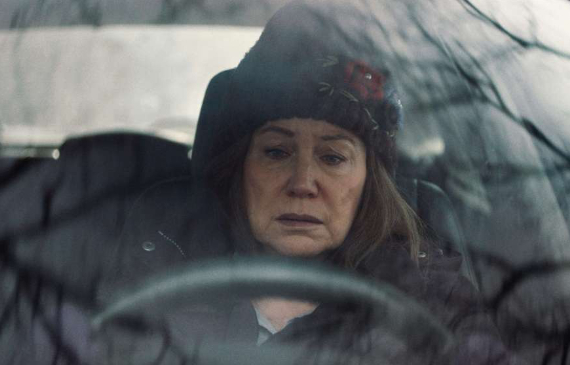 Diane, played gently and brilliantly by Mary Kay Place, is a generous and selfless person spending her days caring for the poor, feeding the homeless, visiting the sick, and helping her adult son Brian (Jake Lacy) in the throes of drug addiction. She is the epitome of the corporeal works of mercy. But, something else lurks beneath her dark and pensive eyes. She struggles with something from her past that threatens to choke her very existence. Jones says the story comes from his own family’s experience. Diane is, “basically my mother,” he shares. That scene in the movie where everyone is gathered in the kitchen, “that’s the kitchen in Belchertown (Massachusetts) where they would all gather.” It truly reflects the small town experience that family is there when you need them the most. The film shows Diane working at the soup kitchen after having a blowup while visiting her son who pushes her away ashamed of his addiction. Her friend Bobbie (Andrea Martin) tells her, after Diane gets angry with one of the volunteers, “You need some peace.” Shame. That little word colors this film. Shame is something that hangs over our heads for which we have not forgiven ourselves or asked forgiveness of others. When we avoid facing our truth, the reality of our mistakes and sins, no matter how long ago, our conscience still pricks us about them until we can face them head on with forgiveness and mercy. Her cousin Donna (Deirdre O’Connell) is in the hospital struggling with cancer. Diane visits her everyday to just be with her to talk, play cards, or simply just pass the time in each other’s company. This film is about the beauty of time. There is no rush to do things, although Diane does do a lot for other people, life moves at a slower pace where people enjoy people. It is a film about family and the need for those relationships that we take for granted the most. When we only have each other, each other is crucial to quell that hunger for connection in this sometimes seemingly cruel world. Photo credit @2019 IFC Films. All rights reserved. When her past mistakes are revealed and the people she loves are out of her care, Diane copes by driving. The image of her in the car is symbolic of time passing. She goes to the mountains where it snows. She looks up. The trees are like a cathedral where she silently, desperately seeks peace and ultimately forgiveness. Guilt engulfs her. A striking moment of redemption comes when Tom, a man who comes to the soup kitchen, who was once a short order cook and friend to Diane’s husband, tells her, “When I come here for a hot meal, I feel bad about my situation, but when you serve me, Diane, I feel sanctified.” No matter what she struggles with interiorly her loving goodness still shines forth and people notice. When her son returns from rehab he meets a Christian girl who helps him convert his life to Christ. When they try to insist to Diane to come to their church she refuses and storms off insisting that they leave her alone. She is not an overly religious person, but she obviously has faith. She just cannot tolerate their insistence. The film shows that near her bed is a Crucifix and a bible. In time, God’s grace works in her life, slowly and surely. All is in God’s time who knows a person’s heart and soul. Diane is in need of healing and the grace of life in the midst of death holds its own healing elements. Each day is a gift. Each day we are given is opportunity to live gracefully and serenely. At the beginning of the film Diane would make a list of everything she needed to do that day. She slowly begins to write poetry instead of lists. The emotional awareness of life as gift transforms Diane interiorly, giving her a new outlook on life. Though this is a simple film it is by no means simplistic. It is a realistic portrayal of life through the symbolic everydayness of grace at work. When a person is genuinely good, seeking redemption, offering hope to others, grace takes over to provide healing and wholeness. God always seeks us out calling us to newness of life. Diane finds that wholeness through her daily self-offering, recognizing that life itself is a precious gift. Looks like another must see!